Sugar is the new tobacco: Why are all my healthy foods so full of sugar? I don’t want anyone to worry that I’m writing a post about food. I’m perfectly fine or at least as fine as could be expected for someone who like almost everyone else in the U.K. this week seems to have realised that almost all their foods are packed full of sugar. I don’t like Starbucks, I don’t drink coffee, I hate whipped cream which means I will never find out what a Frappuchino is but isn’t 11 tea spoons of sugar outrageous? I could have a large meat pizza that at least would fill me all day for the same or less levels of unhealthiness. Graphic from Daily Mail. When it comes to their diet as much by chance than anything else, I am reasonably healthy but not particularly so. By nature I much prefer savoury foods than sweet foods so have never had more than a bit of a doughnut, danish pastry or any sweet more sugary than a very plain chocolate (UK or Belgian hmmm). For at least the last 10-12 years I’ve always taken great care over what I eat and lost about 4.5 stone in the process though from time to time 1 or 2 come back and I have to lose it again but I never get to how I was when I grew up. Aside from one or two small frozen pizzas every month, my food intake doesn’t really vary much and is generally very healthy. Branflakes or low fat diet for breakfast about 360 days of the year. I eat my main meal about midday which again is much healthier than evening meals and it is usually soups, jacket potato with beans and cheese, chicken salads or left over Sunday roasts, rice and chicken. That sort of thing and with maybe just some fruit around 4pm. I’m not a vegetarian but I’m not a big meat eater. I can go all week or all month without having any and then I’d prefer chicken or turkey over anything else. Maybe some locally farmed sausages or home-made beef burgers 5 or 6 times a year and that’s about it. As I don’t like sweet things, I never really have desserts. Who ever originally invented muesli type foods probably never intended that it would have 23 grams of sugar in a good sized portion. May as well have ice-cream for breakfast. Whenever I buy anything that is packaged rather than fresh produce, I always check the labels to make sure it is low fat so you can imagine my surprise when like many others it was highlighted in most media outlets for 3 or 4 consecutive days that nearly all food is impregnated with sugar, even or especially so the healthy eating ones. I can understand if doughnuts are full of sugar, that is the point but why should my glass of orange juice contain more sugar than a doughnut? 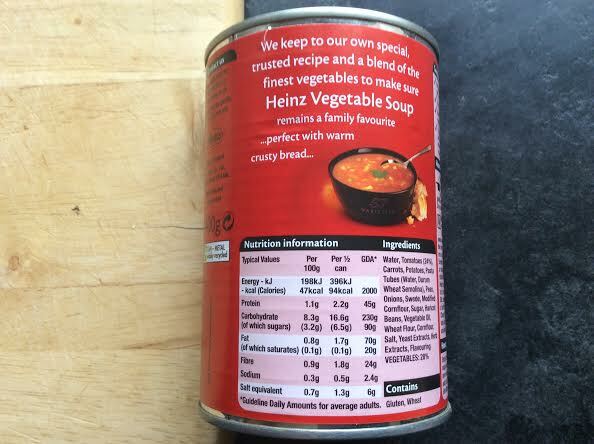 Why is a tin of Heinz soup containing as much sugar as candy or sweets? The reason is of course is that over the previous decades, food manufacturers have gradually increased the sugar levels in their foods, particularly so about 10 years ago when public pressure made them reduce their fat levels. It seems that almost every food type is packed with sugar that needn’t be there. In bread, soup, health products, even crackers and bran flakes which are as dry and unsweet as can be imagined. I have no desire to eat any sugar whatsoever. I don’t have any in my cups of tea, I don’t even like sugar. Obviously sweet things taste to sweet to me, even my apples are of the older sour variety. If I go to a bakers I’d rather have a meat or cheese pie or pastry than anything else. So why then is all my food full of sugar? Don’t the manufacturers realise that someone who eats bran flakes isn’t primarily motivated by the taste and especially not a sweet taste? 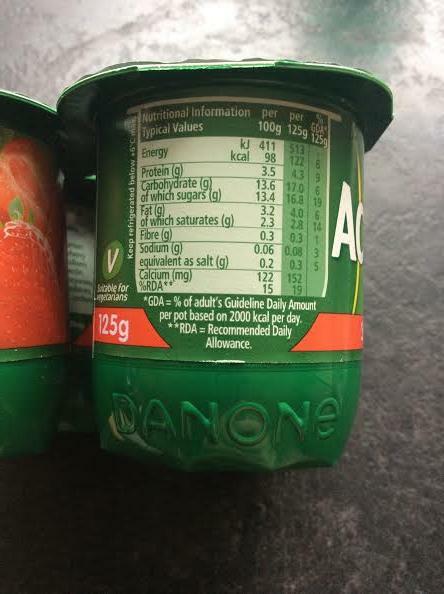 If one chooses an extra healthy yoghurt as opposed to an already healthy in comparison to other foods normal yoghurt that the last thing I want to have is sugar. If I wanted sugar I’d have sugar. Should vegetable soup be peas, carrots, potato, onion maybe? Where does 13 grams (4 teaspoons of sugar come into it? I have no problems with eating foods with natural levels of sugar. I know some people try and avoid all sugar but I have no problems with sugar that is in food naturally. I can handle the 1.4 grams of sugar in a few potatoes. That isn’t going to hurt anyone but the near 5 tea spoons of sugar in a Heinz Vegetable soup isn’t natural. Luckily we eat a lot of home made food made from scratch, probably about 75% of our meals are that way. We don’t add sugar or salt to anything and our soups and breads taste much better than anything I have bought. So why do the food manufacturers do it? At least give people the choice to have food with out added sugar. I feel that I would lose more weight if I wasn’t consuming so much sugar. I did a test yesterday and my sugar intake was still 15% higher than that recommended in the USA which I expect is probably higher still for European levels. If with all my efforts I am consuming all this unwanted sugar, then the average person doesn’t have a chance. To think all these years of eating relatively healthy foods and they have only been healthy fat wise. I may as well have just eaten for years at McDonalds or ready-meals…. except I don’t like them because they are too sugary and fatty. In the future I can see I am going to be eating not much more than root vegetables and lean meat. I pretty much did that for the 2 week Christmas and New Year period and despite eating more than I usually would, felt much better in almost every way. Bizarrely, because we often go for the cheaper food options they are often healthier than more expensive foods or foods bought from more expensive stores. Many have lower sugar and fat levels which is a bonus to us. I guess its because the cheaper foods don’t deserve to have even more yummy fats and sugars to make them taste nicer. I think that new food regulations should be brought in to ban excessive sugars (and fats) in foods and imagine that in 50 years time people will look back in horror almost like people do today about smoking cigarettes or using poisonous substances and metals like lead and aluminium in foods and food production centuries ago. Really, people shouldn’t even have to worry about food labels. There should be no foods and certainly no “healthy options” that contain anything but trace levels of sugar and fat, if any. If the food is on the shelf, it should be as healthy as if I cook it myself after all I just have a pan and an oven to make meals from the foods I grow or buy from farm markets and people like Heinz, Danone and Tropicana have untold resources to give us the healthiest food possible. Despite the NHS and many respected news outlets stating that there is too much sugar in foods and that it is likely behind the ever growing obesity levels and generally all foods must have their sugar levels reduced by 30%, the organisation Sugar Nutrition UK denied there was any problem at all. Well they would wouldn’t they? The recommended daily limit in the UK is 70 grams of fat and 90 grams of sugar though many suggest 40 grams of sugar is what we should be aiming for. With that being the case, unless I eat only natural and unprocessed products, even with having a fat intake of less than 10 grams, my very healthy daily meals are when it comes to sugar unhealthy. What could be more healthy and boring than branflakes. Well boring anyway. This is a budget own brand product, other more expensive and tasty varieties can have double the sugar or even more. It’s already shaping up bad for breakfast. Branflakes (what could be healthier than branflakes) and orange juice equal 33 grams of sugar (presuming the glass of orange is 200ml, mine is 300 or so so I have broken the limit by 6am. I may have well have had bacon and eggs. Trying to be healthy, the only drink I have for breakfast is Orange Juice. I have a large glass every day as orange juice is healthy isn’t it? I may as well pour it down the drain as 10% of it is sugar. Then for lunch how about a jacket potato (lets say 1 gram of sugar) and a tine of beans on top which comes in at 25 grams of sugar. I may as well had a pepperoni pizza or cheese burger. Baked beans, one of my treats as it isn’t salad or yoghurt and is hot. Also more sugary than chocolate or doughnuts. Just a tiny snack later in the day, a yoghurt at nearly 17 grams of fat. A tiny pot of yoghurt? Surely yoghurt is just berries mixed with milk? From the garden it would have hardly any sugar but here I may well just eat straight from the bag of sugar and save washing the spoon. All in all, without any extras or treats or even healthy things like fruit or cereal bars let alone drinks, it comes in at 85 grams of sugar which is just under the maximum limits and twice as much as the more healthy limit. 85 grams of sugar is equal to nearly 22 tea spoons of sugar? Who in their right mind would want to eat that amount of sugar? And that’s me making a concerted effort not to eat anything fatty. Some days, I’m not even full for more than a few minutes at lunch time. I think you’ll agree that these meals are in no way fatty or traditionally thought of as being unhealthy and yet they definitely are if you are worried about sugar or your weight levels. Should I just eat raw vegetables day in day out or eat some junk food for a change? On the evidence above, unless you make all your food yourself, low fat just equals high sugar. Pretty much the only breakfast cereal that has zero sugar is Shredded Wheat which I’ve never had but I guess is like Weetabix. Just my glass of orange juice and branflakes every morning for breakfast comes to 15695grams of sugar a year or nearly 16kg / or 29 pounds of sugar. If I swapped that for shredded wheat and a cup of tea my morning sugar intake would be zero. I don’t know enough about diets but I imagine that would result in quite a bit of weight loss. In 2008 the average American consumed 60kg / 28 pounds of sugar alone each year. Sugar is both unhealthy, unnecessary and highly addictive and medical opinion is leaning more and more towards it being responsible for obesity and diseases such as diabetes rather than the main problem being fatty foods. If anyone could tell me how much weight I’d lose from just changing my breakfast to a non-sugar alternative and saving that 16kg/28 pounds, I would love to know! This entry was posted in Life, News and tagged Cooking, Culture, Diet, food, Food guidelines, Health, healthy eating, Junk Food, Life, Sugar. Bookmark the permalink. 34 Responses to Sugar is the new tobacco: Why are all my healthy foods so full of sugar? how about having porridge for breakfast. that has no suger in it. but be warned, u will add suger to it, because it is not everyone who can eat porridge without suger. you say shredded wheat got zero suger, not possible, it has suger or u will never eat it. even myself who dont have a sweet tooth have to put in a few dried sultanas in my porridge. i would say a general rule of thumb to reduce suger in your diet is simply prepare and eat foods from the raw ingredients. that means no canned stuff. yogurt is very sour if u make it yourself and it is easy to make. you will find that u will have to add some suger to make it palatable. that is why i dont eat yoghurt. even milk got suger added to it. unless you use dried milk. i dont think forcing the manufacturers to reduce the suger in their product will work, because people will add their own suger to it. a lot of foods taste bitter or sour without suger. I tried shredded wheat this morning, it has 0.3g of sugar for 2 of the large wheat parcels and it tasted just as good as branflakes but had 11 grams less sugar. I must admit I prefer weetabix which is only fractionally more sugary than shredded wheat and still around 11grams better than the branflakes. I only tried porridge for the first time a few weeks ago. I didn’t find it that appetising, my wife puts sugar or honey in hers but to me that defeats the purpose of having something healthy. Still I might try your idea of some dried sultanas. I think you are right that the only way to ensure no extra sugar in your diet or at least to be in control of the sugar you add is to make it all from scratch. I just find it bizarre that so much sugar is added to health products when most people who eat them must be doing so to try and be good rather than for their taste. Many people would prefer more obviously unhealthy foods but try to make choices that on the surface seem better. 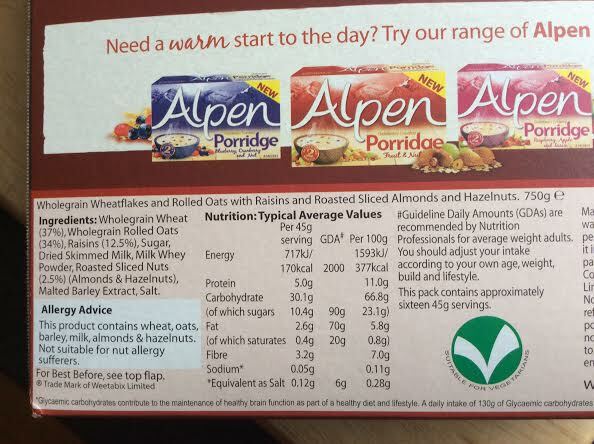 I saw yesterday some Kellogg cereals that were more sugary than chocolate bars and some muesli that was 60% sugar, more than very sugary fruit pastels. Anyway to the best of my knowledge I am 36 hours into not having any sugar except for naturally low amounts in vegetables and I have quite a big headache, probably withdrawal symptoms. i had a look at the ingredients in my tesco basic oats, and guess what! it has 1.5g of suger in 100g. 1tsp =4g. haha. it looks like it is impossible to have no suger. the sunday times today has a list of all the suger in basic foods. i see beer has no suger. haha. i think now that people are aware of these sugers in food, the manufacturers will use sweeteners. they wont appear in the list. perhaps it is not how much suger or fat etc in the foods but how much foods we eat. no body says ‘eat less’. haha. i daresay they wont be popular if they say that. whilst it is so popular and easy to blame the manufacturers for putting so much suger in it. There are very few packaged foods with no sugar. 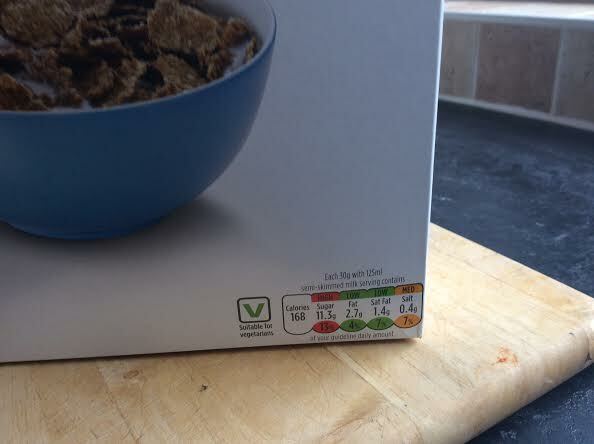 Your tesco oats still has 8 times less sugar than my Asda bran flakes! Yes, eating less is always good. I don’t have problems with sugars in unhealthy foods but not in healthy ones. 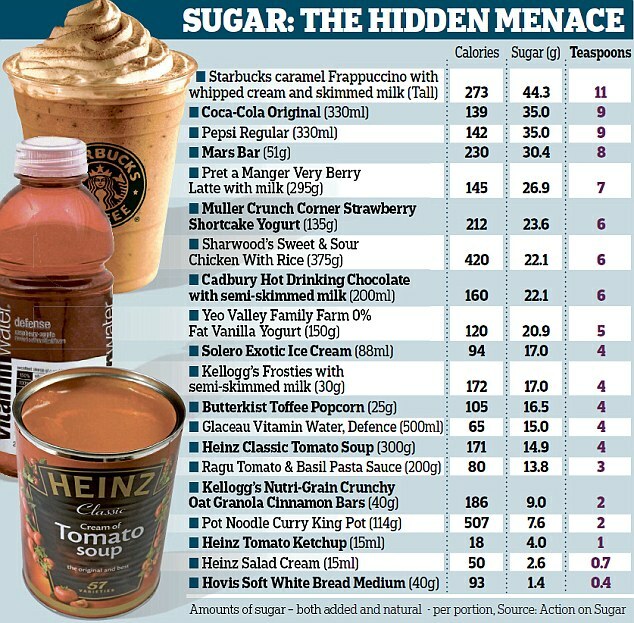 Now I know, what sugar I do have will be in ice-creams and the odd chocolate bars, not cereals or curry sauce! I am convinced that the processing of foods has a lot to do with the number of illnesses and changes in behaviour that we are seeing in the generations coming through now. When I was a child, you never thought about what you ate and I cannot ever remember hearing any member of my family talking about dieting and losing weight. In those days, pretty much everything was home made, the bread, the pastry etc… and so we weren’t eating anywhere near as much ‘ready’ food as we are today. The trouble is that our lifestyles have changed so much that we have much less time than we ever did and so the time to make food from scratch as we used to do is limited – thus, we use the packaged stuff for ease. I am hopeless at checking labels, I tend to go with what I like and as a result, have some unwanted weight that I would love to shift. But… there has been such a marked change in the health and behaviour of our children from what it was when we were young, that I can’t help thinking all of these preservatives and sugar are playing a big part in that. Great post. I totally agree Jade. In the 70’s and early 80’s people ate pretty much what they wanted and no-one seemed to be obviously unwell. Ready food was a brown bread sandwich not an Curry Microwave meal at 22.1 grams of fat. I’ve always read the labels and am generally happy to have healthy food rather than what I really want to have so feel a bit cheated that many of them haven’t been anyway near as good as I hoped. I never had orange juice until a year ago and started having it as I thought it was healthy, I was quite happy with water. I switched to Bran from weetabix for my cereals as it higher in fibre which I though was good and yoghurt from bread but every well intentioned choice seemed to be totally wrong. You’re right, the behaviour of many people and especially children is much different than it used to be. Sugar must play a part in the short-attention spans and hyper-activity/short tempers so many have today. I’m convinced that in 100 years time, people will feel sorry for us in the same way that we feel sorry for Victorian people with their long hours in factories and just bread and stew to eat. Thanks so much for commenting, I’m glad you liked my post. Hi Stephen, It’s a sad fact that all carbohydrates – bread, potatoes, pasta, rice and including porridge, which I love, – is converted in the body to sugars anyway. The reason that food manufacturers use sugars is, of course, because they are cheap bulking agents, to a certain extent preservative, and they are addictive! There were two excellent short series of documentaries on BBC TV, ‘The Men Who Made Us Fat’ and ‘The Men Who Made Us Thin’, which I’m sure the current wave of ‘sugar resentment’ came on the back of, and it exposed the cynical subverting of ‘healthy foods’ amongst other things by deliberately replacing fats with sugars. 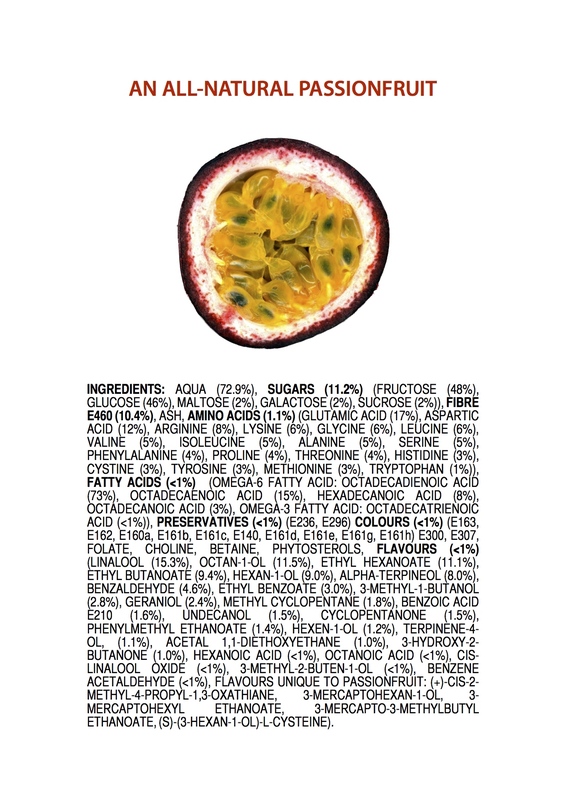 The top ingredient in one so called ‘diet drink’ was sugar! Corn syrup, corn starch, fructose, glucose, lactose, and of course, sugar are all sugars, and you often find more than one on a food label! I buy mostly organic or locally grown veg and meats from local shops where I can. It costs me little more than supermarkets and I rarely throw anything away. The modern ‘convenience foods’ label is another myth too. It in reality takes little longer, if at all, to prepare food than it does to blast something in a micro-wave. Can people really only spare 10 minutes rather than 30 to prepare and cook a meal? Hiya! yes it’s true. Our home made bread with no additional ingredients tastes much nicer than purchased bread but does go rock hard even if kept air tight after a few days whilst mass-produced bread can be left for a few weeks and still tastes as “good” as it did on the first day. I will look up that documentary that you mention. I do buy all my veg from farm shops. 5-8kg for £3 depending on the time of year and 25kg of potato for £7.99 Much better quality and value than from supermarkets. I try and get most of my meat from butchers too including sausages. Last year we got to around May before we had filled our foot high recycling bin as we generally recycle our Sunday roasts until at least Wednesday or even Thursday. It seems to be plastic milk bottles that we unavoidably have to recycle every week. Cooking properly at the weekend and storing or freezing it for a week is a great way to have home-cooked meals any day of the week. Sorry Stephen but you have completely missed the point. Manufacturers only produce what we want, they are constantly competing to shift more product off the shelves than their competitor. Because most people buy the cheapest burgers they are forced to cut corners to make theirs cheapest so they sell more units and we end up with horse meat burgers. Because most consumers look for the lowest fat content (Mr Liddell) they strive to produce low fat foods. That fat has to be replaced with something, you see it is a binding agent, that gives food a nice consistency and helps the flavours to stick to our tongue making food much nicer to eat. Sugar kind of does the same and adding extra sugar didn’t affect the sales so it was a natural choice. There is another reason sugar is added to all our foods and that was a fad a couple of decades ago to get rid of nasty preservatives. 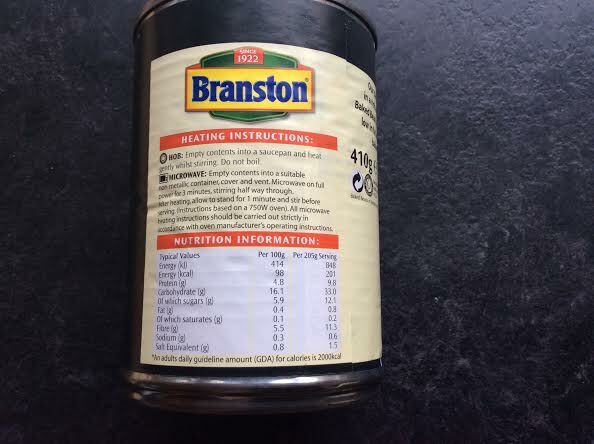 Remember when a jar of Branston could be kept in the cupboard for years no problem, that was down to preservatives (E numbers) well guess what, they found a way to get rid of them, use sugar instead. Sugar isn’t as good so you now have to keep it in the fridge and use within 6 weeks but hey its ok because there are no nasty preservatives. In short there is only one person to blame for all this, the person buying the products. Don’t buy it and they wont make it. You just need to persuade everyone else not to buy it as well 🙂 Personally I would rather have the better quality meat, not cheapest, some fat and preservatives instead of bucket loads of sugar… but I’m a tiny minority. Hi Ian 🙂 yes I remember all that bother about additives and e-numbers 10 or 15 years ago. At least they went from unnatural ingredients to natural ones, even if they are put in things that it shouldn’t be in. I’m with you and would always rather have less of high quality meat than the horse-meat type products (what do people expect for the price). Obviously if they were as clear on the sugar side of things as they reluctantly came with the fats then many people wouldn’t buy them, as I won’t in future. You’re right though, it could take decades before everyone else does likewise. Taking about meat now you’ve really made me fancy a home made beef burger but I think it is roast veg and chicken on the menu today. Thanks for commenting… hope the book is coming on! The book’s stop start but mostly stop at the moment, its been hard to find the time to write in the last couple of months. There is only one sure fire way to diet and that is to eat less not eat different. Have that yogurt you love, you know that lovely creamy fruity one that you long for, just have a smaller portion. And if everyone stopped fad diets and did the same the manufacturers would simply produce smaller portions of the same great products. One problem with the ban sugar movement growing in the media today is that manufacturers will have to replace the sugar with something else and in 10 years time we’ll be having the same discussion about whatever that may be. 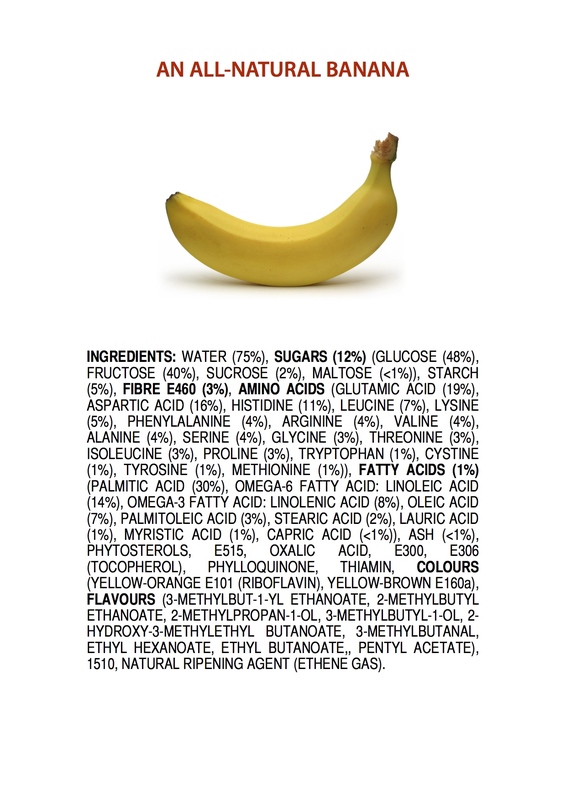 If they cant use fat and they cant use sugar… I wonder what wonderful natural product will be used? Anyone investing in palm plantations at the moment? The latest wisdom seems to be that low fat is actually not good for you. Reasonable amounts of healthy fats are desirable and necessary. The great evil is sugar and it’s everywhere. High fructose corn syrup is particularly deadly. It is funny how scientific opinion keeps changing and how something definite in one decade is to a large part disproven in the next. If you can view it on the internet later, their is a tv show midweek on BBC2 entitled ‘sugar v fat’ which should be interesting. This is why I don’t eat processed foods! Massive amounts of sugar and salt for flavor, not to mention msg and man made flavorings. I used to eat nothing but, with dessert 3 times a day! The funny thing is now that I’ve stopped I don’t really miss it. I have tried a couple of things that I used to love, like a Hostess Ding Dong. After one bite I threw it away, it was disgusting, ugh!! My mouth was coated with a film of grease and I felt like I was eating plastic. Never again! So my food rules are simple: eat real food. I won’t eat anything with fake sugar, or margarine. I know what sugar and butter are, but if I can’t pronounce the ingredient I don’t eat it. It sounds like you have a good food outlook on life. It is strange how quickly you can get used to not having something and then you try it again and it tastes horrible. I remember until a teenager I I used to have 2 spoons of sugar in my tea. I stopped having tea for 3 months and when I resumed it without sugar it tasted perfect. The funny thing is that I like many of the natural foods in small portions and when I have to eat something perhaps meatier or in someway unhealthy, I still wish I had just been able to have a salad or chicken and rice and feel unfulfilled in a food sort of way. I agree that the amount of sugar added to foods is incredibly high. In my journey to reduce processed foods from my diet because of GMOs and chemicals (like dyes), I’ve automatically reduced my sugar because I make a lot myself and don’t add the sugar. For breakfast every day I eat Organic Scottish Steel Cut Oatmeal grown the next province over (I live in Nova Scotia, Canada). There is 0 sugar in it because it is just the oats. I don’t add milk or sugar. I love the taste just as is. However, if I have them, I add about a tablespoon of berries (blueberries or raspberries) to the cereal. This adds natural sugar, but I’m fine with that. I also make my own bread, so I can regulate the sugar (and oils and other things that don’t belong in bread). One loaf contains one teaspoon of either sugar or honey. I have one slice a day, topped with homemade raspberry jam (two cups of frozen berries to 1/4 cup sugar; that’s it; no Certo). I don’t follow jam recipes because they have a cup of sugar for every cup of berries. That’s crazy. You don’t even taste the berry. I round off my breakfast with a cup of tea sweetened with a teaspoon of honey. I make a lot of meals and I don’t add sugar to things like soup, stews or chowders. Even my pizza is homemade. I don’t see the purpose of adding more sugar. The food already tastes great. Like you I don’t like coffee, so Starbucks anything is not appealing. I also ask the same question: If people who want to eat healthy choose healthy food because they think they are eating healthy, why are food producers still adding lots of sugar? Frankly I don’t trust the food industry any longer. I don’t bother looking at the nutrition chart; it’s useless. 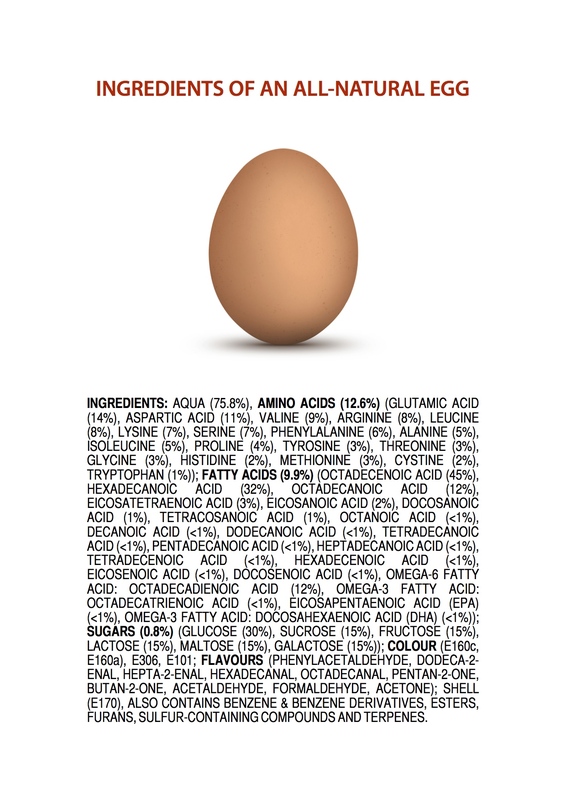 I instead look at the ingredients. I’d rather get my sugar from grapes than fructose, and the nutrition label doesn’t distinguish between them. Hi Diane, I aspire to follow your way with entirely home-made foods. Sadly, I don’t really like oats even with added sugar or honey (something I never did anyway as I always intend not to eat added sugar and I don’t like honey as it is too sweet for me). Your bread sounds delicious, when we make bread, we too skimp on the sugar and it tastes much nicer than shop bough produce. You’re right about how the recipes go over the top with regards to sugar… and oil and butter. You don’t really need any of it and they still taste wonderful. We do some of our pizzas home-made and the others we use a base and add our own toppings but the home-made ones taste best especially when you know the toppings are fresh and natural too. I do think that in x many years in the future, the bosses of food companies will be about as popular as cigarette businesses were by the 1980’s. If not actively causing the deaths of millions, they are at least heavily responsible. I don’t trust them either whether fast food or supposedly wholesome family foods with long histories pretending they care for us. The bottom line is they all want to make a profit and get as much cash from us as they can for the least investment in good ingredients as they can get away with. I’ve never added either sugar or honey to my bread. It is a myth that it is needed for the yeast to rise. My bread is flour, water, yeast. Optional additions may be olive oil, tomatoes, onions, herbs, depending on what type of bread I make. I don’t have a sweet tooth so I’ve never bought sugar. I think you’re spot on. As someone who has almost the opposite of a sweet tooth, I find it doubly bad that foods are tinkered with and myths about sugar being required being perpetuated. I would much rather have your bread than from the shops, I’m sure it is much nicer. I like cheese/tomato flavour if you are taking orders! What a great post Stephen! Great post Stephen! There is a great documentary called “Hungry for Change” which explains very clearly the food processing industry and their manipulation of food products to meet their own ends, which is to make a huge profit at the expense of the food consumers. They are not interested in whether what they produce is healthy or not, whether it causes obesity or not, just in selling as much as possible! I think you would find it very worthwhile watching it and also looking at the “Terry Wahls” diet – she is a doctor who was suffering from MS, changed her diet which resulted in a significant improvement in her symptoms – basically, the diet is all about eating as much fresh organic food as possible and nothing processed! Happy, healthy eating to you! Thank-you, I’m glad that you enjoyed it. You’re right, the food industry is pretty much like the tobacco industry of the 20th Century. I am now 4 days in and am feeling much better than this time last week. I do miss my glass of very sweet orange juice at breakfast though but I expect to get over that in the next week or two. It appears that sugar is in over production. Therefore supply is pushing the demand in what should have been other way round. My guess is that by sugar also acts as some kind of natural stablising agent which adds shelf life to these products but I am not sure. But I agree there is too much sugar. Thank you Kate! It has now been 2 weeks and the only thing I miss really is orange juice. I find the ability to have more vegetables and lean meat is actually what I always wanted rather than try to be healthy by having healthy options that are full of sugar. The first day or three were tough but after that I began to feel much better. I hear that your energy levels can keep improving for a month after giving up artificially sweetened food. I will definitely checkout your recipes when I get back home in a few days. The fact is that your curry or burger is so much tastier and with none of the sugar of something like Heinz soup. The amount of sugar in shop bought curry sauce is dreadful, you may as well just eat a plate of sugar. Thanks for commenting! 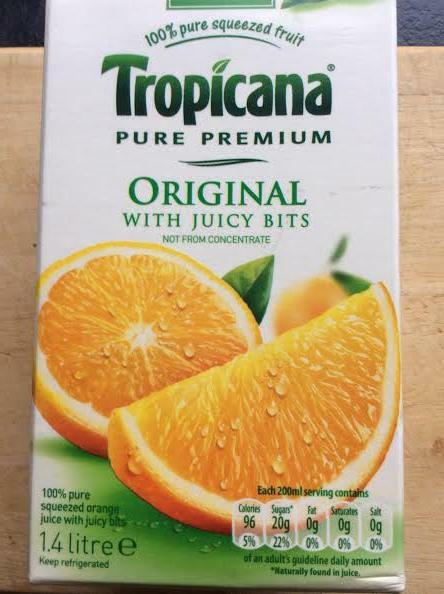 just a thought since you are missing orange juice – why don’t you juice oranges to make fresh orange juice – you only need a couple and it is delicious! You don’t even need a fancy juicer, I have a plastic juicer which goes over a small jug. Hi Fiona, will that taste “as good” as juice from the carton? I will try that as I used to drink a large glass every morning. I enjoy having the tasty but non sugary foods I always preferred. Not noticed any weight loss yet after 2 weeks but I am feeling a lot better. So glad to be rid of those bran flakes too! I think you will enjoy it far more than the juice from the carton!